This installment of Legendary Games’ so far impeccable line of weird receptacles of knowledge forbidden and foul is 8 pages long, 1 page front cover, 1 page editorial/SRD, 1 page introduction/how to use, 1 page back cover, leaving us with 4 pages of content, so what exactly are these spellbones about? Content wise, this fetish allows the possessor to create ghouls and ghasts and also features two new feats – one to reflect that you have consumed one of the dead and thus are hardened by your ghoulish act of cannibalism and a metamagic feat that makes those slain by your magic temporarily rise as flesh-eating fast zombies. Nice! 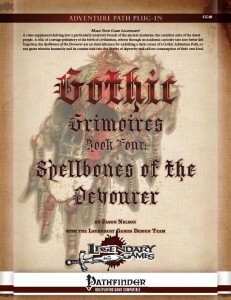 6 new spells are also available via the study of this grim fetish and all are geared towards a theme of ghoulish dread and cannibalism – whether it’s the two versions of devouring maw, which allow the caster to gain razor sharp teeth that not only transmit ghoul fever, but which may also make you swallow creatures whole and grab them. Flensing skin, muscle and tissue from your victims becomes as much an option as inciting a murderous hunger for flesh in undead or even evil creatures. finally, there is a truly horrific spell linked to a new template in this pdf – a spell that makes the subject devolve into a thoul – a living ghoul that is closer to the depictions of the creatures as portrayed in the cthulhu-mythos than the regular PFRPG-ghoul. The CR +2 Thoul-template is btw. a beauty to behold – not only does the recipient gaining bleeding attacks, a blood frenzy and bonuses for indulging in acts of cannibalism, they also get a quality that makes them great servants for mythos-creatures – susceptible, yet immune to some of the more debilitating effects associated with eldritch horrors. A special weakness that appeals to the remnants of sanity still left completes what is an excellent template. Editing and formatting are top-notch – As I’ve come to expect from legendary Games, I did not encounter a single glitch within these pages. Layout adheres to their 2-column standard and the full color artwork is, as I’ve come to expect as well, on par with the quality one would see from Paizo, perhaps even beyond that. The pdf is also fully bookmarked, which is awesome for such a small pdf. Narrative-wise and concept-wise, this Gothic Grimoire is up to the insanely high standard the line has set for itself, providing a compelling and twisted piece of lore supplemented by neat crunch. The Thoul-template is narrative gold and the spells per se are intriguing – still, when compared to “The Inverse Calculus of Unseen Refraction” or the “Sepulchral Swaths of Tanoth-Gha“, the spellbones feel slightly inferior. Mind you, there is nothing wrong per se with this installment of Gothic Grimoires – far from it! But the spells contained herein feel slightly less innovative and beyond the template, were mostly what I would have expected from a ghoul-themed grimoire. Does that make the pdf bad or faulty in any way? No. But in a line of superb, drop-dead brilliant book, this is “only” a very good installment. Hence, my final verdict will clock in at 4.5 stars, still rounded up to 5 for the purpose of this platform. You can check out this fine piece of macabre lore here!